Learn a tree grows a ring for every year it is alive. The layers of a tree help protects it and help it grow (bark, cambium, sapwood, heartwood). Use your age to draw rings of a tree. Tell Me, Tree: All About Trees for Kids by Gail Gibbons. GREAT family library resource. 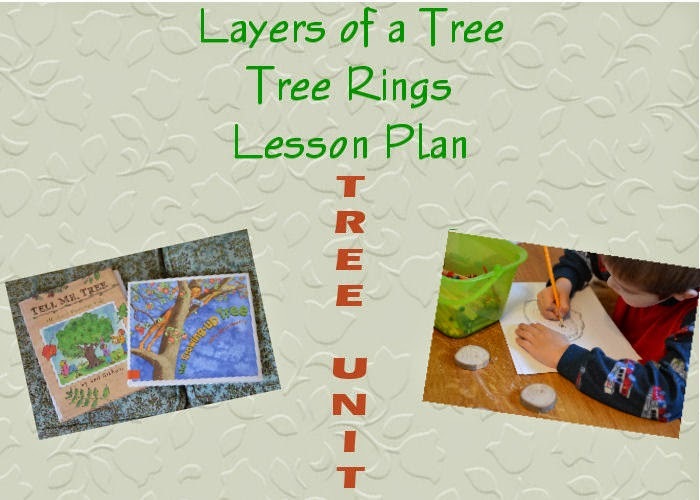 This lesson would focus on the "Inside of a Tree" Pages and layers of bark and wood. The Growing-Up Tree By Vera Rosenberry Be aware, this book does touch on the death of an old man as the tree his mother planted on the day of his birth is knocked down in a thunderstorm the same time he takes his last breath. Read it ahead of time to see if you feel comfortable reading it to your kids. It was brief moment of sadness, but a lovely lesson on how life goes on through our family (seedlings & grand kids). 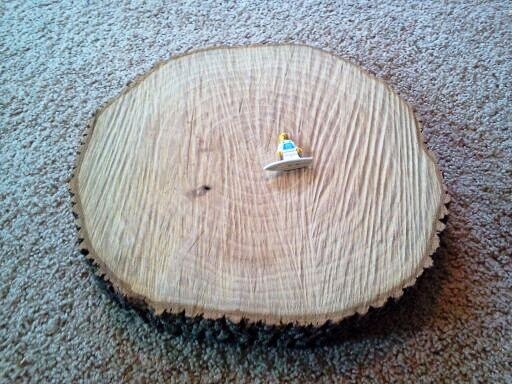 I am very blessed with a father-in-law who owns a saw mill, so we have a assess to big tree rings. If you do not have this accessibility, any tree branch that is at least a few inches will do. We counted the rings on this ring to see how old it was, and saw how there was a layer between the Sapwood and Bark. TIP: If you are near the holidays and buy a real tree for your family, ask the farmer to cut a small ring off the bottom for your kids to study. Be careful of pine during warmer months (above 45 degrees) because the sap starts unfreezing and you may have a sticky tree ring! We also cut some rings from a few branches (bass and pine), and studied them with the magnifying glasses, guessing how old the branches were. Some branches had branches growing out of them, which led to fun discoveries of what growth abnormalities look like, and how two branches or trunks can form next to each other. We copied the shapes and different ovals and circles from the tree rings. After reading "Inside of Tree" pages , focusing on the layers of a tree-ring, from "Tell me Tree", each of use drew a tree ring that was our age. My 6 year old drew a tree with 6 rings and I drew one with 30 rings (you will need a big piece of paper for that one;). We labeled them "Inside a Your Name Tree". The center of a tree ring is the heartwood, which makes the tree strong and stand tall, so a small heart was the middle of our tree rings. You can use a paper plate if you'd like, but my boys likes using blank paper so they could make their circles irregular like the branches we had just studied. .
For older kids, don't forget to draw the layers of the tree, including Cambium and Bark. We also discussed Sapwood because we had just been on a Maple Syrup Field Trip. As always, my boys always take my idea and make it better. After drawing their own tree rings they drew an "Inside of a ___ Tree" for all their cousins who are different ages, therefore different number of rings.